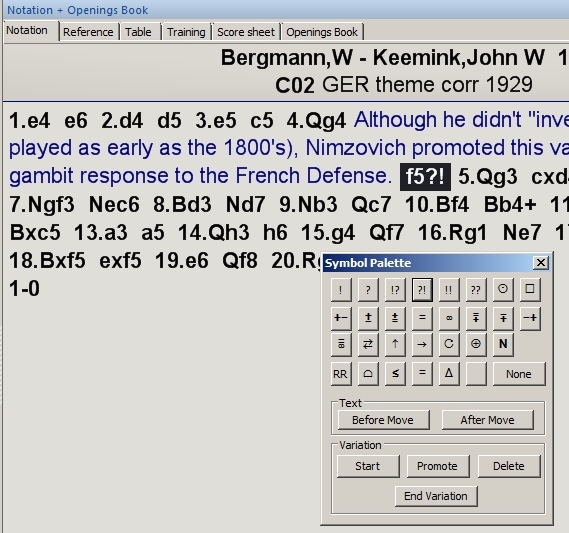 Many players at some point in their chess career find themselves annotating chess games. It might be a tournament player adding notes to a gamescore a few days after an event, or a correspondence player preserving his analysis and commentary to an ongoing game. 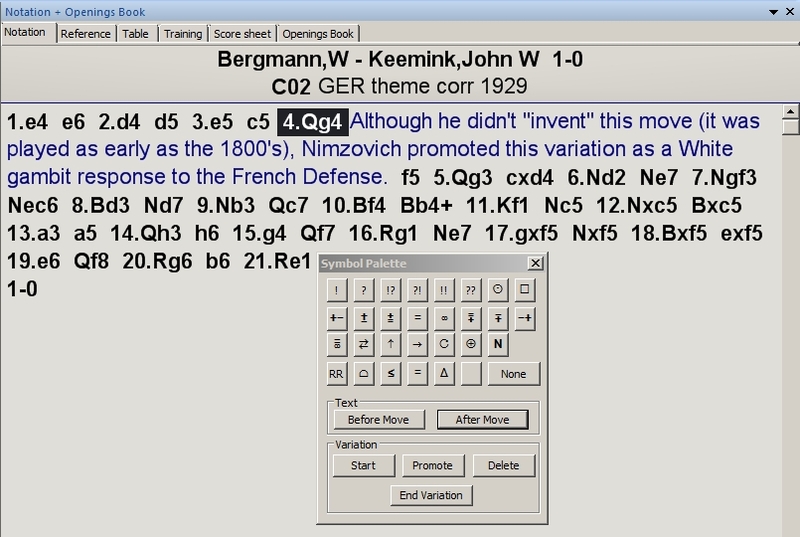 In my specific case, annotations are generally added in the course of writing a chess article or editing a chess book. An often used feature of ChessBase 11 is the ability to quickly and easily add variations, comments, and symbolic commentary (such as !, ?, =, etc.) to a game. But, quick and easy as this is, a lot of users don’t know about a special shortcut which makes adding commentary even easier. 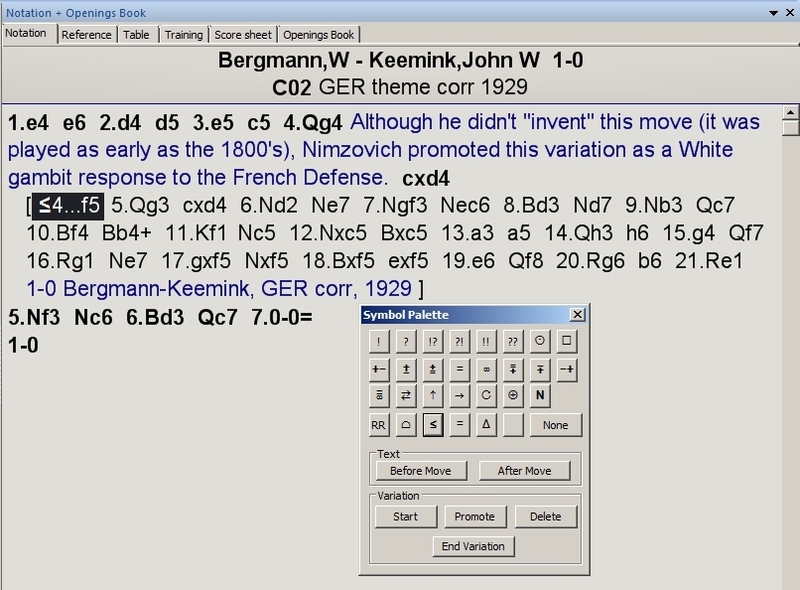 It’s called the Symbol Palette (formerly known as the Annotation Palette in previous ChessBase versions). 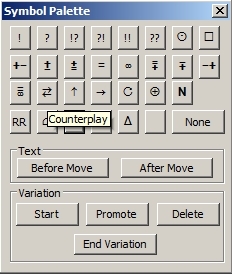 It’s a small “floating” window which contains the most often-used chess commentary symbols as clickable buttons. 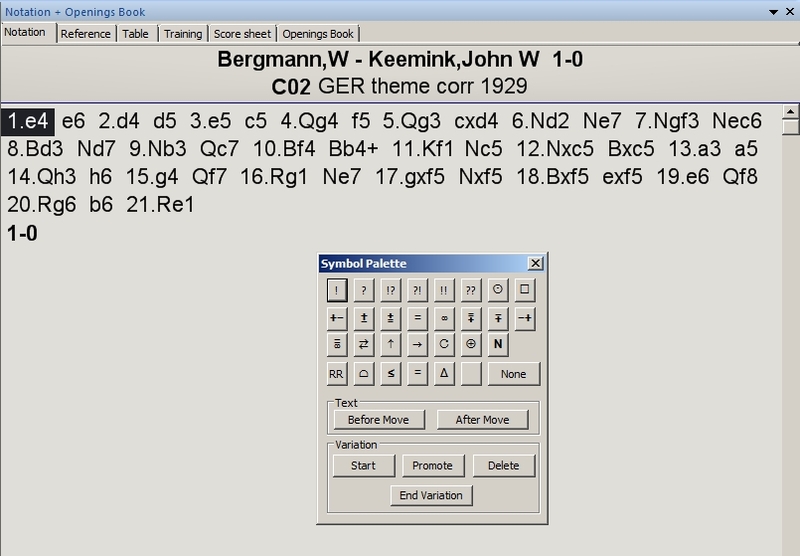 There are three groupings in the Symbol Palette depending on the specific task. 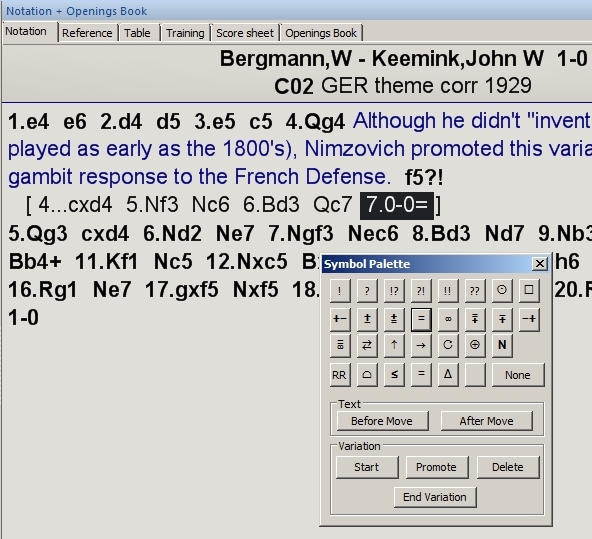 The upper section consists of the primary “punctuation” used in the Chess Informant-style notation, which has become the common “language” of chess (I would have used the term lingua franca, but I don’t know how to spell it). This symbolic notation allows for easy non-verbal communication; for example, a Russian grandmaster can annotate a game using these symbols and his commentary is understandable by anyone who understands this notation. Don’t scoff – the great Polish-Argentine GM Miguel Najdorf could convey more with these symbols than most annotators do writing in their native tongue (I refer the reader to the Najdorf-commented games in early 1970’s issues of The Chess Player as proof). 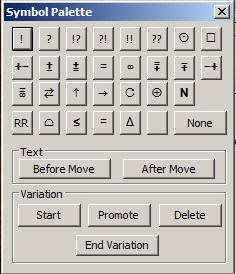 If you don’t know what the symbols mean, you’ll find them in the ChessBase 11 Help file. Click the “Index” tab in Help, type the word “commentary” (minus the quotes) in the box provided, then double-click on the link for “Commentary symbols”. The second section provides quick shortcuts for adding text before or after a move, while the third section allows you to quickly add (and sort) variations. Let’s take a quick look at how all of this can be used in practice. 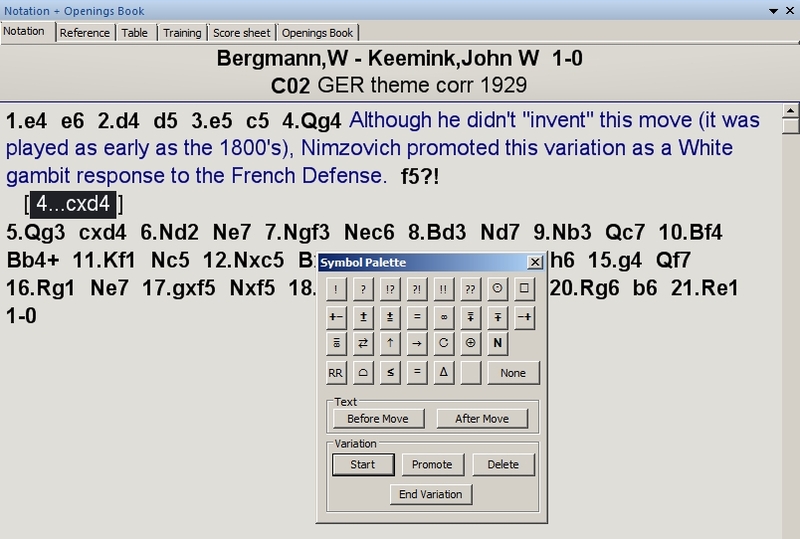 I’ve loaded a game from Mega Database 2011 in which an interesting gambit variation of the French Defense was played. It’s an old Aron Nimzovich idea which I’ve played myself more than once. I can continue to add moves, notes, comments, symbols, etc. to this game. 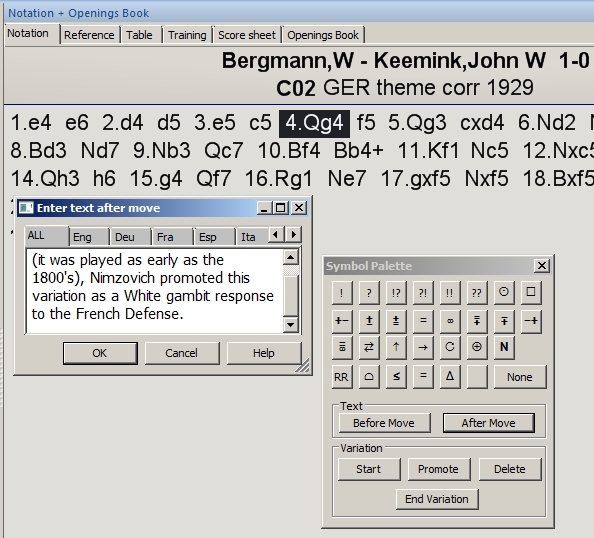 When I finish (and want to save the work into my database) I’ll need to remember to use “Save game” instead of “Replace game” (so as to not overwrite the original Bergmann-Keemink game in my database), as well as change the game citation (which defaults to the original source) to something like “French Advance” for the White player, “Nimzovich gambit line” for the Black player, and “Analysis” for the tournament name. And if you’ve added a symbol to a move in the gamescore, then change your mind later and wish to remove that symbol, just click on the move to highlight it and then click the “None” button from the group of symbol buttons to remove the symbol. Finally, if you’re finished using the Symbol Palette but don’t want to close the whole game window, simply click on the “X” in the upper right-hand corner of the Symbol Palette to close it in ChessBase 11.